The compact Brother MFC-J680DW all-in-one colour inkjet printer is designed for micro-offices and homes. This network-ready unit has a monthly duty cycle of 2,500 pages. It offers an easy-to-use control panel and also boasts an ADF and duplexer. With the Brother MFC-J680DW multifunction printer, users can easily print exceptional-quality photos. This model has limited paper handling capacity. The Brother MFC-J680DW inkjet all-in-one with fax features a small, coloured touchscreen display on its control panel along with function buttons. A 100-sheet paper tray is at the bottom and a 20-sheet automatic document feeder is on top. Aside from a USB port, this unit also has a USB flash drive for direct printing and a memory card reader. The Brother MFC-J680DW colour inkjet printer weighs 18.3lbs and measures 15.7 x 13.4 x 6.8lbs. This Energy Star-qualified multifunction printer can also scan, copy and fax. It boasts a maximum resolution of 1200 x 6000dpi to ensure excellent details for photo printing. The Super G3 fax machine has a 14.4 kbps transmission speed and can save up to 200 pages. Users can easily connect to the Brother MFCJ680DW inkjet multifunction printer as it offers Wi-Fi, Wi-Fi direct, and is compatible with cloud and mobile printing. 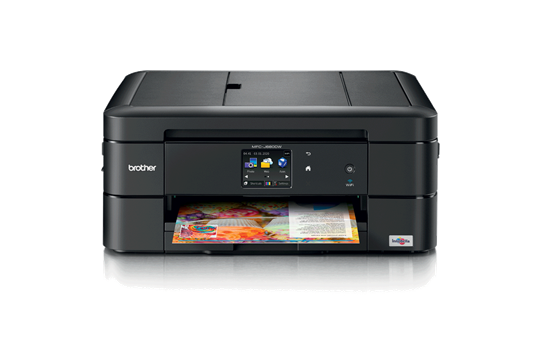 The Brother MFC J680DW all-in-one printer with fax could be better if it had expandable or flexible media handling. This model isn't built for high-volume printing and is only ideal for small workgroups.